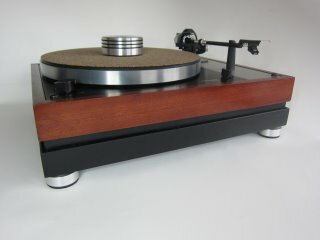 An detailed list of compatible THORENS models you could find at each product description. The improved x-model available. The new x-Variant has additionally to the 5 absorber under your THORENS 3 high-grade absorber feet with integrated damping consisting of Sorbothane, cork and natural rubber; instead of spikes. The double absorption lead to a perceptible improvement in the sound. 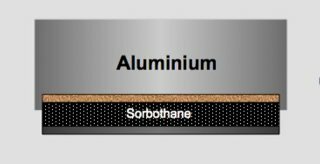 Absorption under the THORENS with 5 absorber 4 Absorber under the feet of the THORENS®. One absorber central under the weak base plate of the THORENS eliminates the negative vibrations of the often critized labile metal base plate. The double absorption lead to a perceptible improvement in the sound. No Installation: Plug&Play Place your turntable into the bFly-audio absorber plate and your THORENS looks like on the pictures. Your turntable increased by 4,3 cm. Please verify the width of your THORENS. It should be 43cm. Installation: Dismount the original feet of your THORENS. 4 replacement screws are enclosed. 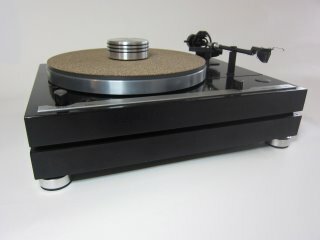 Place your turntable into the bFly-audio absorber plate and your THORENS looks like on the pictures. Your turntable increased by 6 cm.